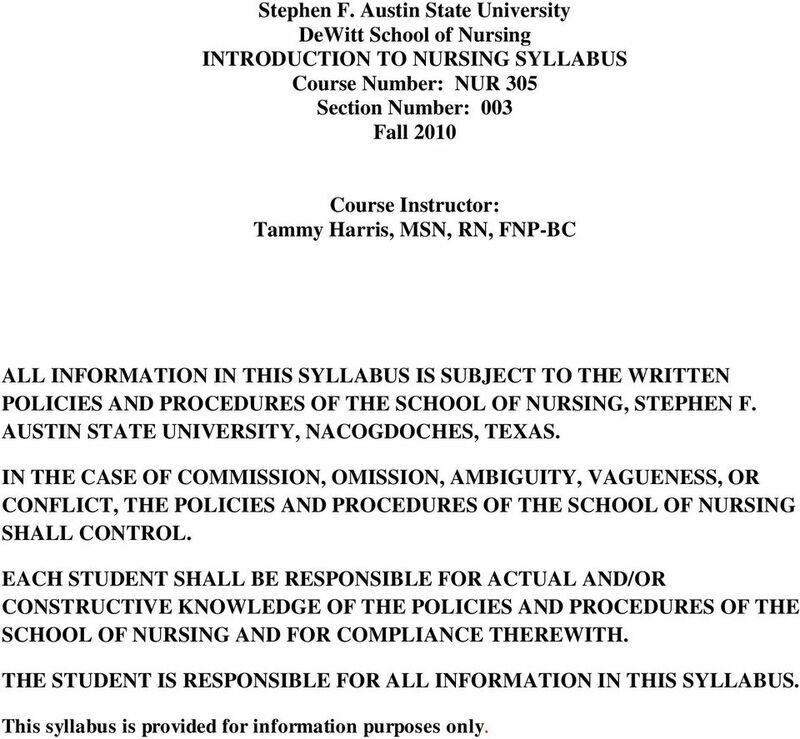 Download "Stephen F. Austin State University DeWitt School of Nursing INTRODUCTION TO NURSING SYLLABUS Course Number: NUR 305 Section Number: 003 Fall 2010"
1 Stephen F. Austin State University DeWitt School of Nursing INTRODUCTION TO NURSING SYLLABUS Course Number: NUR 305 Section Number: 003 Fall 2010 Course Instructor: Tammy Harris, MSN, RN, FNP-BC ALL INFORMATION IN THIS SYLLABUS IS SUBJECT TO THE WRITTEN POLICIES AND PROCEDURES OF THE SCHOOL OF NURSING, STEPHEN F. AUSTIN STATE UNIVERSITY, NACOGDOCHES, TEXAS. IN THE CASE OF COMMISSION, OMISSION, AMBIGUITY, VAGUENESS, OR CONFLICT, THE POLICIES AND PROCEDURES OF THE SCHOOL OF NURSING SHALL CONTROL. EACH STUDENT SHALL BE RESPONSIBLE FOR ACTUAL AND/OR CONSTRUCTIVE KNOWLEDGE OF THE POLICIES AND PROCEDURES OF THE SCHOOL OF NURSING AND FOR COMPLIANCE THEREWITH. 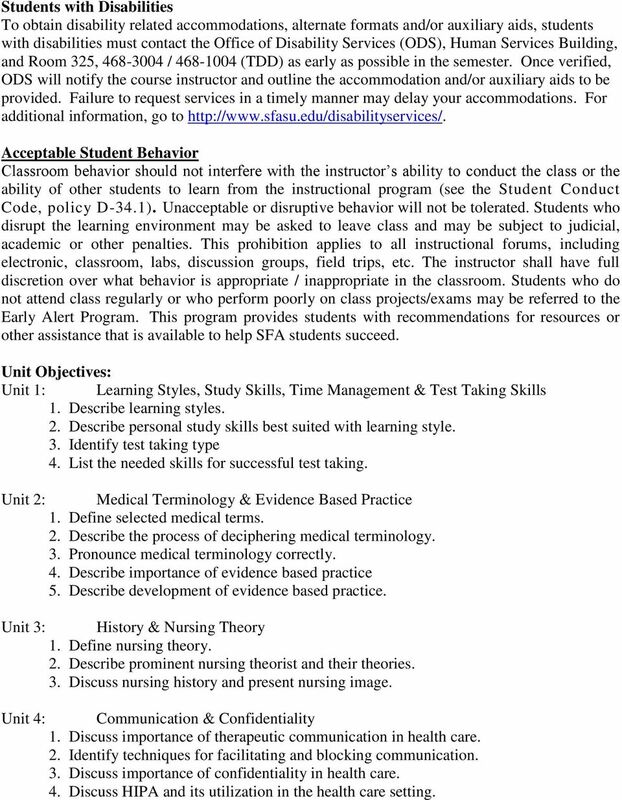 THE STUDENT IS RESPONSIBLE FOR ALL INFORMATION IN THIS SYLLABUS. This syllabus is provided for information purposes only. 2 Faculty Contact Information: Name: Tammy Harris, MSN, RN, FNP-BC Department: Nursing Office: Room 158 Office Phone: (936) Office Hours: Wednesday, 10:00 a.m. 2:00 p.m. Thursday, 3:00 p.m. 5:00 p.m. Friday, 8:00 a.m. 12:00 noon Other times by appointment Class Meeting Time and Place: Wednesdays, 8:00 a.m. 10:00 a.m. Room 111 School of Nursing Building, 5707 North Street Textbooks and Materials: Zerwekh, J. & Claborn, J. (2009). : Transition and Trends (6 th ed.) St. Louis: Saunders Shiland, B. (2009). Mastering Healthcare Terminology (3rd ed.) 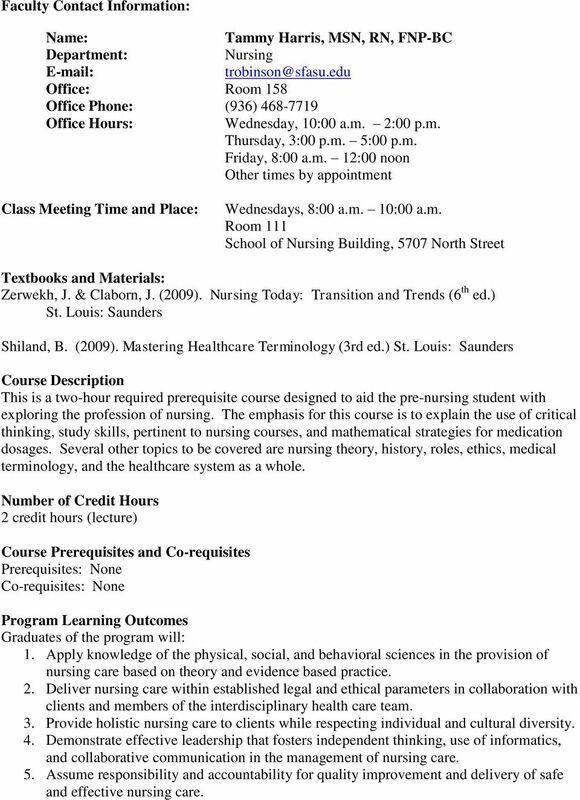 St. Louis: Saunders Course Description This is a two-hour required prerequisite course designed to aid the pre-nursing student with exploring the profession of nursing. The emphasis for this course is to explain the use of critical thinking, study skills, pertinent to nursing courses, and mathematical strategies for medication dosages. Several other topics to be covered are nursing theory, history, roles, ethics, medical terminology, and the healthcare system as a whole. Number of Credit Hours 2 credit hours (lecture) Course Prerequisites and Co-requisites Prerequisites: None Co-requisites: None Program Learning Outcomes Graduates of the program will: 1. Apply knowledge of the physical, social, and behavioral sciences in the provision of nursing care based on theory and evidence based practice. 2. Deliver nursing care within established legal and ethical parameters in collaboration with clients and members of the interdisciplinary health care team. 3. Provide holistic nursing care to clients while respecting individual and cultural diversity. 4. Demonstrate effective leadership that fosters independent thinking, use of informatics, and collaborative communication in the management of nursing care. 5. Assume responsibility and accountability for quality improvement and delivery of safe and effective nursing care. 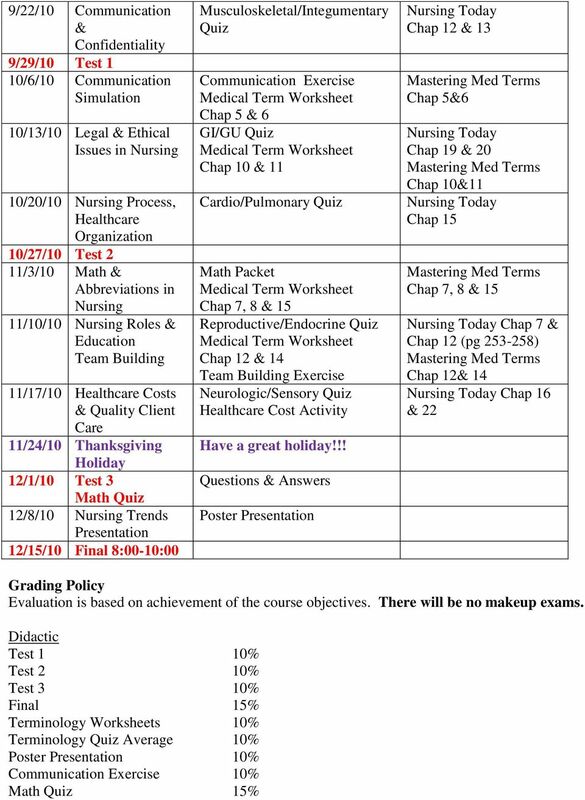 5 Grading Scale A= B=80-89 C=70-79 D=60-69 F=59 and below Nursing students must have a minimum grade of C in this course to be eligible for admission into the nursing program. Attendance Policy Attendance is encouraged. Attendance will be considered when a student is in jeopardy of failing. Attending the course will increase the student s successful completion of the course. Makeup work for absences is usually not acceptable and will be at the discretion of the instructor. Academic Integrity (A-9.1) Academic integrity is a responsibility of all university faculty and students. Faculty members promote academic integrity in multiple ways including instruction on the components of academic honesty, as well as abiding by university policy on penalties for cheating and plagiarism. Definition of Academic Dishonesty Academic dishonesty includes both cheating and plagiarism. Cheating includes, but is not limited to (1) using, or attempting to use, unauthorized materials to aid in achieving a better grade on a component of a class; (2) the falsification or invention of any information, including citations, on an assigned exercise; and/or (3) helping, or attempting to help, another in an act of cheating or plagiarism. Plagiarism is presenting the works or ideas of another person as if they were your own. Examples of plagiarism are 1) submitting an assignment as if it were one s own work when in fact, it is at least partly the work of another; (2) submitting a work that has been purchased or otherwise obtained from an Internet source or another source; and (3) incorporating the words or ideas of an author into one s paper without giving the author due credit. 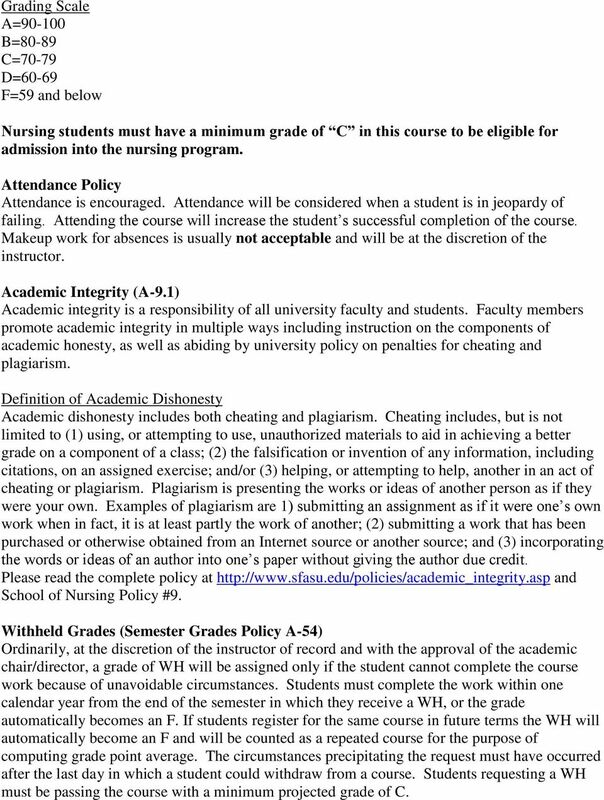 Please read the complete policy at and School of Nursing Policy #9. Withheld Grades (Semester Grades Policy A-54) Ordinarily, at the discretion of the instructor of record and with the approval of the academic chair/director, a grade of WH will be assigned only if the student cannot complete the course work because of unavoidable circumstances. Students must complete the work within one calendar year from the end of the semester in which they receive a WH, or the grade automatically becomes an F. If students register for the same course in future terms the WH will automatically become an F and will be counted as a repeated course for the purpose of computing grade point average. The circumstances precipitating the request must have occurred after the last day in which a student could withdraw from a course. Students requesting a WH must be passing the course with a minimum projected grade of C.
6 Students with Disabilities To obtain disability related accommodations, alternate formats and/or auxiliary aids, students with disabilities must contact the Office of Disability Services (ODS), Human Services Building, and Room 325, / (TDD) as early as possible in the semester. Once verified, ODS will notify the course instructor and outline the accommodation and/or auxiliary aids to be provided. Failure to request services in a timely manner may delay your accommodations. For additional information, go to Acceptable Student Behavior Classroom behavior should not interfere with the instructor s ability to conduct the class or the ability of other students to learn from the instructional program (see the Student Conduct Code, policy D-34.1). Unacceptable or disruptive behavior will not be tolerated. Students who disrupt the learning environment may be asked to leave class and may be subject to judicial, academic or other penalties. This prohibition applies to all instructional forums, including electronic, classroom, labs, discussion groups, field trips, etc. The instructor shall have full discretion over what behavior is appropriate / inappropriate in the classroom. Students who do not attend class regularly or who perform poorly on class projects/exams may be referred to the Early Alert Program. This program provides students with recommendations for resources or other assistance that is available to help SFA students succeed. Unit Objectives: Unit 1: Learning Styles, Study Skills, Time Management & Test Taking Skills 1. Describe learning styles. 2. Describe personal study skills best suited with learning style. 3. Identify test taking type 4. List the needed skills for successful test taking. Unit 2: Medical Terminology & Evidence Based Practice 1. Define selected medical terms. 2. Describe the process of deciphering medical terminology. 3. Pronounce medical terminology correctly. 4. Describe importance of evidence based practice 5. Describe development of evidence based practice. Unit 3: History & Nursing Theory 1. Define nursing theory. 2. Describe prominent nursing theorist and their theories. 3. Discuss nursing history and present nursing image. Unit 4: Communication & Confidentiality 1. Discuss importance of therapeutic communication in health care. 2. Identify techniques for facilitating and blocking communication. 3. Discuss importance of confidentiality in health care. 4. Discuss HIPA and its utilization in the health care setting. 7 Unit 5: Legal & Ethical Issues in Nursing 1. Describe several legal/ethical theories utilized in health care. 2. Discuss the role of the nurse in ethical/legal matters. 3. Define ethical legal terms. 4. Explore the ANA Nurses Code of Ethics. 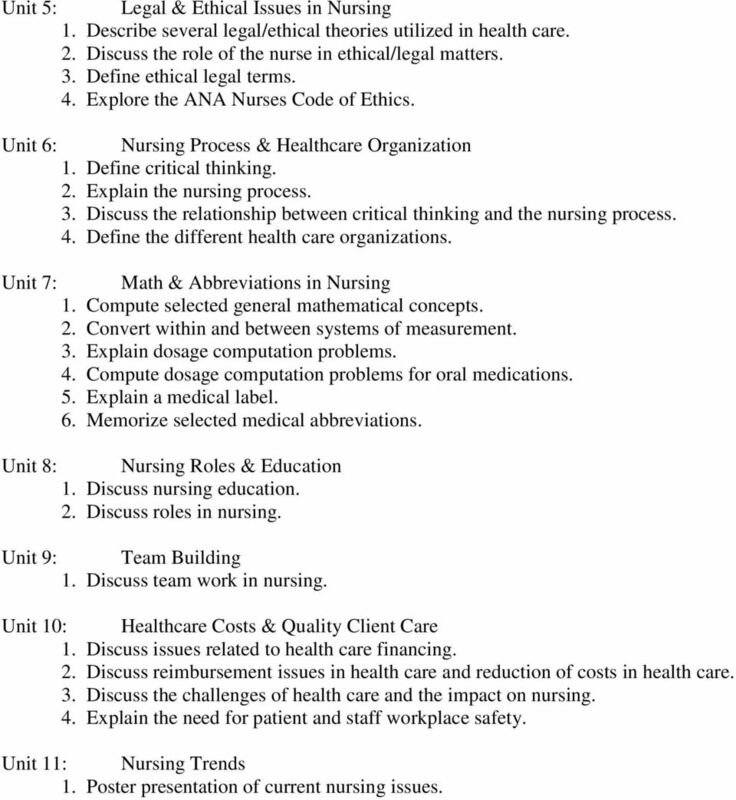 Unit 6: Nursing Process & Healthcare Organization 1. Define critical thinking. 2. Explain the nursing process. 3. Discuss the relationship between critical thinking and the nursing process. 4. Define the different health care organizations. 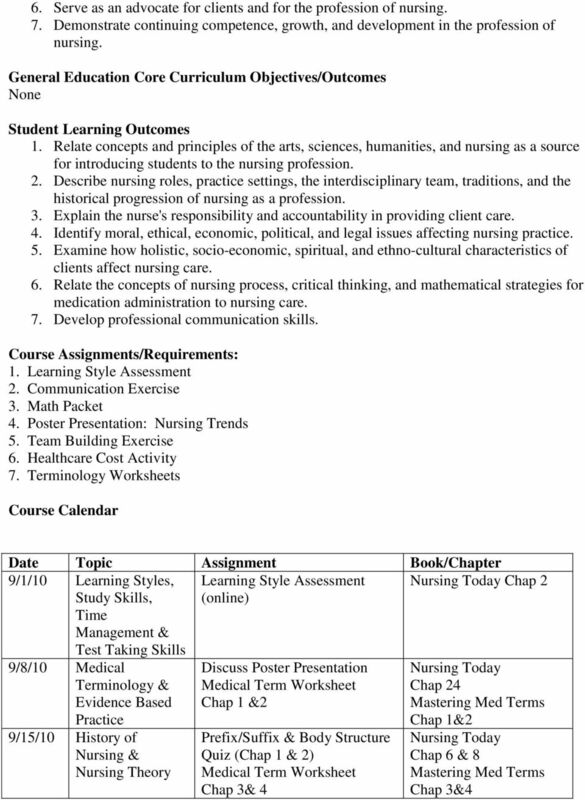 Unit 7: Math & Abbreviations in Nursing 1. Compute selected general mathematical concepts. 2. Convert within and between systems of measurement. 3. Explain dosage computation problems. 4. Compute dosage computation problems for oral medications. 5. Explain a medical label. 6. Memorize selected medical abbreviations. Unit 8: Nursing Roles & Education 1. Discuss nursing education. 2. Discuss roles in nursing. Unit 9: Team Building 1. Discuss team work in nursing. Unit 10: Healthcare Costs & Quality Client Care 1. Discuss issues related to health care financing. 2. Discuss reimbursement issues in health care and reduction of costs in health care. 3. Discuss the challenges of health care and the impact on nursing. 4. Explain the need for patient and staff workplace safety. Unit 11: Nursing Trends 1. Poster presentation of current nursing issues. HMS 146 - Introduction to Family and Child Development Spring 2014 (March 6 May 9) Instructor: Johnny Sue Reynolds, Ph.D., CFCS, CPFFE Course Time & Location: Online Only Office Hours: Online Only Dr.
DEVELOPMENTAL PSYCHOLOGY PSY 376 SECTION 001 * Spring 2012 Class Meeting: MWF 9:00-9:50AM in MCKB Room 257 Stephen F Austin State University INSTRUCTOR INFORMATION Instructor: Andrew M Terranova, Ph.D. Comparative Criminal Justice Systems CJS 350 SYLLABUS Spring 2015 Instructor: Dr. Milton C. Hill Office Hours: Office: Liberal Arts North, Room 113 Monday/Wednesday Phone: (936) 468-2295 office 10:00 a.m. COURSE WEBSITE: http://leonardo.sfasu.edu/jjohnston *This is essential for success in this class. Class Times and Location: CJS 101.03 meets in F471 at 2 PM - 3:15PM TR. American Nurses Association. Guide to the Code of Ethics for Nurses with Interpretive statements. Copyright 2008. ISBN: 9781558101760. Course MIS Enterprise Resource Planning Professor Dr. Lou Thompson Term Fall 2011 Meetings Tuesday and Thursday, 5:30-6:45 PM, SOM 1. January 10, 2011. Course MIS6319-001 Enterprise Resource Planning Professor Dr. Lou Thompson Term Spring 2011 Meetings Thursday, 4-6:45 PM, SOM 1.